She’s older now, I thought. The blonde bob, the square jaw with a complexion that’s classic English rose, still radiates but the eyes were wearier: less Lulu, more Julie Christie after a wild night. Seeing her made me wonder if her most recent engagement at Joe’s Pub would be 1) a shoe-string affair (only a piano, a guitar and a few drums dotted the stage), and/or 2), a case of fallen-idolatry. Would Julia Fordham still measure up to the artist I’d loved and cherished since her eponymous debut some 30-odd years ago? Happily, the answer turned out to be yes. Hers is a sound that’s sustained me for all these years, but while we hope our favorite performers will grow older in all the right ways, there are no guarantees. I’m comforted that this British singer whose voice saunters from choir-boy contralto to oboe-ish sonorousness can still cast a spell, whether spinning out songs from her own catalog, or singing covers from her newest release, The Language of Love. That, incidentally, could have been the title of almost all of her earlier albums; it’s Fordham’s special gift as a songwriter to probe the myriad ways we fall in, and out of, that state, while probing what lies in-between (you will hear no finer disquisition on alcohol’s ability to wreck a relationship than her song “A Few Too Many”). 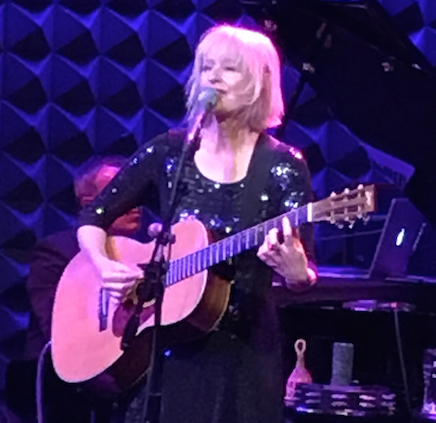 At Joe’s Pub, she didn’t sing it, but there were enough favorites to please her fans—everything from “Manhattan Skyline” (from Porcelain, her second album, and arguably, her peak) to “Concrete Love,” made famous as a duet with India Arie. All were loosely, lovingly performed by that still miracle of a voice, capable of conjuring both melancholy and high spirits before you say octave jump. I wasn’t wowed by The Language of Love when I first heard it, but Fordham’s live rendition of 10CC’s “I’m Not In Love” and her especially mournful, though rhythmic “Eleanor Rigby” made me think I was just tired, or in a bad mood. All this was especially impressive with Fordham playing guitar and a few handheld percussions, the invaluable Alex Alexander on drums, and Julia’s longtime colleague Grant Mitchell on piano/lovely background vocals. They provided rich, newly imagined versions of songs some of us could sing in our sleep. Check out the new CD, and if you missed Fordham on the 1st go-round, I urge you to poke through her catalog. You’ll be rewarded. But then again, I’m proprietary.